TRIVIA of Noh : Q112 :Which Japanese films show the influence of Noh? | Home | Trivia | Q112 : Which Japanese films show the influence of Noh? Was author Izumi Kyōka from the family of a Noh performer? Izumi Kyōka was a famous writer of the Meiji period. His mother was the daughter of a Noh performer who played the large tabor in the Kadono school. As he grew up, Kyōka had close links to Noh. His uncle (his mother's second eldest brother) was adopted by the head family of the Hōshō school, taking the name Matsumoto Kintarō and supporting the school during the Meiji era as a leading disciple of Hōshō Kurō Tomoharu. Kyōka was heavily influenced by the culture of the Edo period and his works are characterised by a supernatural Romanticism. 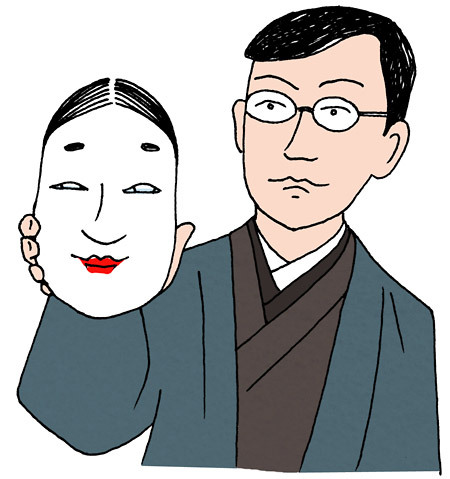 The influence of the art of Noh can be seen in his illusionistic style. In particular, the world of Noh is depicted in one of his masterpieces, "Uta Andon" (A Song by Lantern Light, 1910). In the story, Kitahachi, the nephew of the head of a Noh school, is expelled from the family after he causes the suicide of Sōzan, a blind self-styled master Noh reciter. Meanwhile, Sōzan's daughter Osode is sold to a geisha house and renamed Omie. After the chequered relationship between Kitahachi and Omie unfolds, the story reaches a climax when Kitahachi breaks a taboo by teaching Omie the dance in "Tama-no-dan" (the Scene of the Jewel) in the play "Ama" and she then dances it. The scene shows the unique taste of Kyōka's work, which parallels the subtle and profound beauty of Noh. Among the Noh actors who have been suggested as the model for Kitahachi are Seo Kaname, a leading pupil of Hōshō Kurō Tomoharu who was once expelled from the school, and Matsumoto Nagashi, who was Kyōka's cousin.